Geography is important to figure out early on in your story – otherwise you end up with things spread out too far for what you’ve intended, or sometimes even a desert oasis in the middle of the arctic. So how do you figure out geography? I’m honestly still figuring this one out myself. I can’t draw, nor am I extremely learned in the science behind the why of climates. So I make up a lot of stuff. But that’s the beauty of fantasy writing: I can get away with making up some stuff. It is infinitely easier if your world is modeled after Earth, in the matter of figuring out which climates go where. If you veer from that, don’t worry, though. Artistic license is a wonderful thing to claim! So how do you go about creating the land? Sit down and let each of your characters ‘talk’ to you. Find out where they’re from, and what common landmarks are that they see at home every day. These are things like mountains, creeks, rivers, forests, desert, etc. These are NOT things like homes, or towns, unless building a town or a city somewhere significantly changed the lay of the land. Find out what the terrain is like. Is it fields and plains, or rocky? What is the soil like? How much water does it absorb, or shed? Is the area prone to earthquakes, floods, or volcanoes at all? What was the last major change to the terrain within your character’s lifetime? Is the climate suitable for the terrain you’ve created? Are there different ‘laws of nature’ in your world than in ours? Why? What changes? Since local climates are dependent on where in the world something is located, are your plans consistent with what is actually possible? Do you have a hot desert right next to the polar tundra by accident? Is there too much rain in a desert area? Are there frequently heavy blizzards near the equator? Note: If you’re writing fantasy, some of these things can be explained within reason. You can definitely have a hot desert next door to the arctic if, say, the weather is controlled by magic. Or deities. These are things like mountain ranges, forests, deserts, and sea shores. Giant walls – think the Great Wall of China. Or the walls from Attack on Titan. Hush, either of these are valid, okay? Symbolic boundaries – countries, empires, states, etc. DO make sure to note whether a body of water is fresh or salt. If your characters are humanoid, they must have access to fresh water for survival, whether it is straight from the ground, or through distillation. These will be clumped around major water sources, so do those before this step. A what, you say? Yes, a graphical scale. These are those little tiny measuring sticks on maps that say how many inches (or centimeters) = a certain amount of miles/kilometers/however you want to measure your distances. It doesn’t matter if your fictional world uses a different scale of measure that is either fictional or real. You must have some way that YOU can reliably measure distances from place to place on your map. Trust me. You’ll thank me later when you don’t have to rewrite the timing of any traveling parts of your story. A graphical scale. By Anna Frodesiak. You know, to mark north, south, east, and west. This is not mandatory, but it is helpful if you have more than a few symbols to mark different things on your map. You don’t have to get extremely detailed in your map – this does not need to be a road map like we have nowadays, unless you want it to be. Just make sure you know where the places relevant to your story are, so that you can stay consistent with your writing. Original Image used in header is by Aymaan Ahmed, under a CC BY-NC 2.0 License. The image was Cropped for the Header. Great Theme. I am a fanatic about geography; when I wrote about Ancient Egypt, I did a lot of research of the “lay of the land: – how it was supposed to be then…3000 BC. One of the toughest things to remember was that – when they went upriver – they sailed SOUTH. I always have an atlas nearby – but the Internet was invaluable for my research. Looking forward to more pearls of wisdom from you. Hah, the Nile does flow ‘backwards’, doesn’t it? I’d forgotten about that. I only studied geography for a short time at school, but I did try my hand at a map for a fantasy series I wrote many years ago. I found it more important when people were travelling by foot or animal, than when they have mechanised transport, I think because the distances can be longer in the latter case. The distances are much longer when you’re not traveling by car/train/airship/what-have-you, but knowing the distance between things is still important even with mechanized transport so you can keep the times consistent if characters travel more than one route. I think you need to start with the features you really want to play with and work out from there. 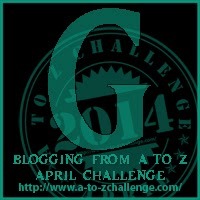 Great theme for the A to Z Challenge. This post is a brilliant resource for writers of all genres, but especially fantasy/sci-fi, where we’re making our own worlds up from scratch. Thank you. Hahaha, my maps usually consist of blob continents until hubby gets his hands on them XD. What a great tutorial. I look forward to reading the rest.